Zagat Score – What is it? How Does it Work? What is the Zagat Score? The Zagat score is basically a rating system for restaurants by diners. It was created by Tim and Nina Zagat in 1979. Keep in mind these are little more than just ratings, these are surveys. The approach is different. The overall ratings are on a 30 point scale. They are based on defined areas such as food, decor, service and cost. These also include selected quotations from several reviewers comments about each restaurant or business they review. How do I increase my Zagat Score? You can register a free account at Zagat.com, once you have an account. Get active, encourage people to vote. Refer customers to the site and ask them to review your restaurant or business. Individual user ratings are based on a 0 to 3 point scale. Google takes these ratings, average them, and then multiply by ten to arrive at averaged scores. When Google doesn’t have enough user ratings on different aspects, they will just show an overall score. An overall score is comparable to a score in the primary aspect for a location, like food for restaurants. Why is my Zagat score important? 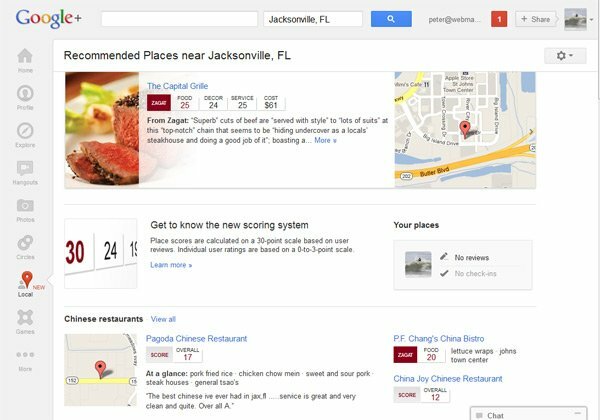 Well that’s simple Google bought it and is using it for the new Google + Local that will replace Google Places. You can sign up for the new Google + Local here. If you take a look at the new pages, there is a noticeable perk to having great Zagat reviews. See screen shot below. Recommended places is going to be huge. It pulls your Zagat score and if you notice only restaurants with decent scores show. As you can imagine, your business in front on thousands of new local potential customers. I am pretty sure you can count on a bad Zagat score = loss in business. So get started today you can sign up here.